Our location in sunny Central Florida makes Highlands Aviation a convenient stopping off point for jets, planes and helicopters on the East Coast and throughout the country. 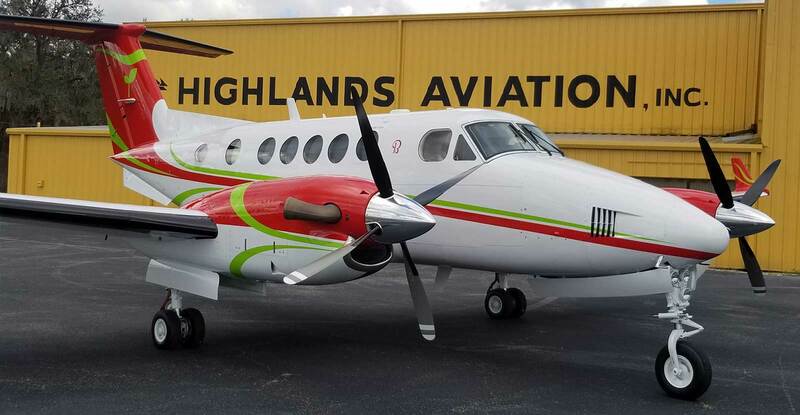 For more than 40 years, Highlands Aviation has provided our clients with reasonably priced, quality aircraft painting delivered on time. Our reputation for detailed workmanship is unsurpassed. Highlands Aviation is a leader in the artistry of interior refurbishment and renovation. We exceed the expectations of our customers when refurbishing aircraft interiors. Since 1974, Highlands Aviation has been providing superior aircraft painting and interior refurbishment rivaling any found in the industry. We provide custom services at very competitive prices. We are the oldest continuously owned and operated refurbishment center on the east coast. Our teams of experienced artisans produce the finest aircraft painting and refinishing available in the industry. Our aircraft refurbishment workmanship can be seen throughout the corporate aviation world. Highlands Aviation is an approved vendor for Bombardier, Textron and Dahar. When you select Highlands Aviation to paint or refurbish the interior of your aircraft, we work hard to make sure you are fully satisfied and get the highest return on your investment.